If you are looking for lake homes for sale/rent, consider homes on Lake Jackson in central Georgia. This intimate lake is celebrated in Georgia for hosting some of the best fishing in the state, in addition to premium recreation opportunities. Situated only 44 miles from the Atlanta metropolis, Lake Jackson is a natural sanctuary where you are invited to relax and make memories. Lake Jackson is easily accessible and manageable in size. It occupies approximately 4 ...Learn more here! 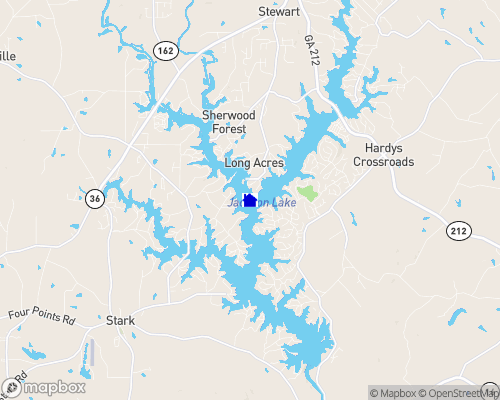 If you’re looking for lake homes for sale/rent, consider homes on Lake Jackson in central Georgia. This intimate lake is celebrated in Georgia for hosting some of the best fishing in the state, in addition to premium recreation opportunities. Situated only 44 miles from the Atlanta metropolis, Lake Jackson is a natural sanctuary where you’re invited to relax and make memories. Lake Jackson is easily accessible and manageable in size. It occupies approximately 4,750 acres of space and touches Newton, Butts, and Jasper counties. Anglers of all skill levels flock to Lake Jackson for full-on fishing marathons and day trips alike, as the waters are inviting year-round. The shoreline stretches 135 miles, weaving itself into hidden coves and quiet inlets. Needless to say, anglers in the know plot out their favorite corner of the lake and settle in for some supreme fishing. Largemouth, striped, hybrid, and spotted bass are the lake’s prized sport fish, and it also hosts impressive numbers of bluegill, crappie, sunfish, and catfish. Whether you fish from the shore or a boat, you’re sure to get a bite! Three public park areas, six marinas, and several campsites surround the lake, ensuring you always have access to the water. The main area of Lake Jackson is also open to boats, water skiing, and other water recreation toys. Lake homes for sale/rent situated along the shoreline have the added advantage of unparalleled scenic views bathed in pink sunsets and bordered by shimmering water. Splash the day away in the cool lake waters or watch it drift by from a shady spot on the beach; either way, you have the best vantage point in town! You can step away from the lake for a good game of golf. Several quality golf courses are situated near Lake Jackson. A few such courses include Turtle Cove, Canongate , and Eagle’s Brooke. Another noteworthy course is Hickory Hill. This semiprivate 27-hole establishment is actually divided into three 9-hole courses, which gives golfers the opportunity to design the game of their choice. If you’re interested in living on a Lake Jackson golf course, check out GolfHomes.com for property listings and details. Intimate, engaging, relaxing, and inviting, Lake Jackson provides the perfect setting for a truly enjoyable living situation. Experience all that Lake Jackson has to offer for yourself and understand why this little lake has won over so many hearts! Reservoir (c.10 mi/16 km long, 1 mi/1.6 km wide), on Butts-Jasper co. border, central Ga., on Ocmulgee R., 7 mi/11.3 km E of Jackson; 33°19'N 83°50'W. Receives (N) Alcovy, Yellow, and South rivers, which form Ocmulgee R. here. Formed by Lloyd Shoals Dam (c.100 ft/30 m high, 500 ft/152 m long), built (1910) for power generation. Popular recreation area. Also called Lloyd Shoals Reservoir. Ranked as one of the best fishing lakes in Georgia, nutrient-rich Lake Jackson beckons anglers with trophy-sized fish. Bream (bluegill), Crappie, large-mouth bass, hybrid bass, catfish, and carp are caught year round. Baits used can be artificial or live, with night crawlers, minnows and crickets topping the list of preferred bait. Marinas and bait stores can advise on what's working best. There is no size limit on a boat or vessel operating on Lake Jackson. However, there is a restriction on GA's smaller lakes (including Jackson) that no vessel can operate on Lake Jackson if it has a galley, a marine toilet, or sleeping quarters (GA Code 52-7-13-D). Lloyd Shoals Public Area Beach, bath houses, picnic pavilion, picnic tables and restrooms located on the west side of the lake at the dam, in Butts Co.
Ocmulgee River Public Access (on the Ocmulgee River below the dam) in Jasper Co.